When Mr. Betts's eight different pets develop spots, he takes them to the vet. Dr. Potts's medicine cures the spots-but gives them stripes instead! 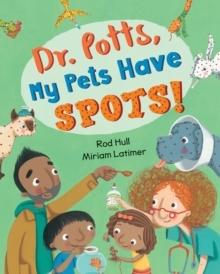 This hilarious rhyming story rollicks along from one problem to the next as Dr. Potts finally cures Mr. Betts's wacky collection of pets.